As time passes our contact lists increase to the extent that we are no longer able to control them and find quickly the contact that we've been looking for. That happens mainly because of the text based and other limited capabilities of the phone. That problem must be especially of current importance for business people who are constantly short of time. WorldCard Contacts is a new iPhone app released by Penpower Technology that helps to solve this problem making it much easier to find the necessary contact. It's designed for iphone and iPod touch and requires iPhone OS 3.0 or later. 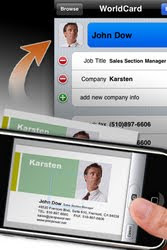 View contacts in either "List Mode" (Similar to the native contact list, except with added photo and company information) or Card Mode (Scroll through your business card book with full card images). All with a quick search function to pinpoint the contact you need rapidly. Make a call, send a text message or email, browse to the company's website, or pinpoint them on a map with simple one button access, directly from their business cards! Works just like the native contacts application from the iPhone including favorites, recent calls, and keypad access. Integrates with the WorldCard Mobile App (sold separately) to let you easily entering contacts via capturing and recognizing business card photos. No more manually entering contacts needed. If you want your iphone to scan and recognize text from photographed business cards and add them to your contacts then Worldcard Contacts app is definitely for you. You can download it right HERE for $5.99!! !